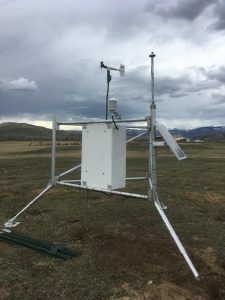 Grand County now has three CoAgMet stations; one near Granby; one on the Troublesome; and a third near Wolford Mountain Reservoir. 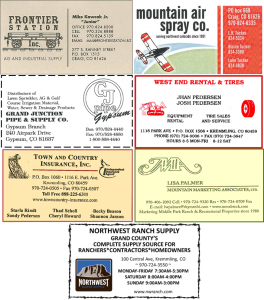 CoAgMet stands for “Colorado Agricultural Meteorological Network”. The stations collect meteorological data that can be used to determine how much and how often to irrigate your fields. In the tables on the All Weather Data pages, the columns that will be most beneficial to you are: Tmax Temp, Tmin Temp, Precipitation, Wind Gust, Wind Run, Soil Temperature, Relative Humidity (RH), and Evapotranspiration Rates (last three columns). Wind Run is a measure of the number of miles the wind blew that day (i.e. how many time the propeller turned on the weather station). The higher the wind run, the windier it was, and the more moisture plants lost via evapotranspiration. The soil temperature column depicts the minimum soil temperature at 2 inches below the surface. Soil temperature can impact plant growth and seed germination. Mark Volt, our District Conservation Technician, always says that you should seed in the fall once you see that soil temperatures are consistently below 50 degrees Fahrenheit (the temperature at which seed germination is less likely to occur). Relative humidity (RH) is the amount of water vapor in the air relative to how much water vapor the air can hold; it is displayed as a percentage. Relative humidity is lowest when the temperature is the highest. Like wind run, relative humidity also impacts evapotranspiration; the lower the RH, the higher the evapotranspiration, and the greater the likelihood a plant is going to dry out. Evapotranspiration is a measure of the amount of water used by a crop during that 24-hour period. This information is very useful to irrigators as the ET is the amount of water that needs to replaced in the soil with irrigation. For example, if you have not irrigated in a week you can check the ET totals for that week and then determine how long you need to irrigate in order to replace the water that was used during that period. Over-irrigation isn’t just an environmental issue; it affects profitability as well. Pumping costs, water delivery charges, lost fertilizer due to runoff/deep percolation, labor, and maintenance costs all rise with over-irrigation. Learn more about Evapotranspiration HERE!